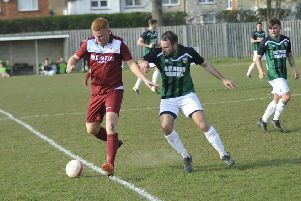 Hastings United’s footballers inched closer to securing a play-off spot, but had to settle for a 1-1 draw at home to Walton Casuals this afternoon (Saturday). United remain in the final Ryman Football League Division One South play-off position of fifth, although they are now only two points ahead of sixth-placed Carshalton Athletic with two games remaining. Carshalton scored two late goals to win 4-3 at home to seventh-placed Lewes, who are now out of the running for the play-offs as they trail United by six points and possess a vastly inferior goal difference. It was a frustrating afternoon for United, who will certainly feel they dropped two important points even though they trailed for 77 minutes. United fell behind in only the third minute. A ball over the top of the home defence led to Jerrome Sobers losing out in a tackle with Moses Ashikodi, who slotted past goalkeeper Ryan Nicholls into the bottom corner. Ashikodi had a great chance to make it 2-0 just five minutes later, but steered his shot wide of the far post from Connor French’s cross. United were struggling to stamp any authority on the game and were grateful to Sam Cruttwell for thwarting Luke Holness as he bore down on goal. French then got to another ball over the top and forced Nicholls into a save. After Matt Bodkin’s half-volley was gathered by Walton goalkeeper Denzel Gerrar, French had the ball in the net following a free kick at the other end only to be flagged offside. United enjoyed a good spell towards the end of the first half, during which Harry Stannard got to Bodkin’s ball over the top just before the outrushing Gerrar and poked it past the goalkeeper only for it to roll against the outside of the post. Gerrar pulled off a terrific save to palm away a Danny Leonard shot which was heading for the bottom corner and five minutes later made another fine stop to repel a Frannie Collin header from Stannard’s cross. In between times, Sobers brilliantly headed a Holness shot off the line. United got well on top in the second half and pressed hard for an equaliser. Stannard lobbed onto the roof of the net within 75 seconds of the restart and moments later glanced Leonard’s low cross whiskers wide of the far post. Leading scorer Collin had a decent chance to level things up, but his header from a good Johnny Akoto cross was held by Gerrar, the game’s stand-out performer. Stannard’s goalbound shot was blocked and Shomari Barnwell headed over from an Akoto cross before United’s second half pressure paid off with an equaliser bang on 80 minutes. Bradley Stevenson, Stannard and Barnwell were all involved in the build-up before Bodkin drilled home a loose ball from around nine yards. With thoughts now turning to finding a winner, Stannard’s angled shot was held by Gerrar, but seconds later at the other end, Holness blazed off target when through. In added time, Bodkin’s shot was just about scrambled wide by Gerrar, who then spilled Stevenson’s long range strike but gathered at the second attempt. Nicholls made a save low to his left in the dying seconds. United: Nicholls, Akoto, Butcher, Emptage (Stevenson 61), Sobers, Cruttwell, Bodkin, Johnson, Stannard, Collin (Barnwell 62), Leonard (Hughes-Mason 74). Subs not used: Black, Rose. Attendance: 535.